For Saint Patrick’s Day 2017, Azur Gaels were invited by the Irish Embassy in France and by Cannes town council to take part in the town “greening” ceremony, in the company of Leo Varadkar T.D and Mayor of Cannes David Lisnard! 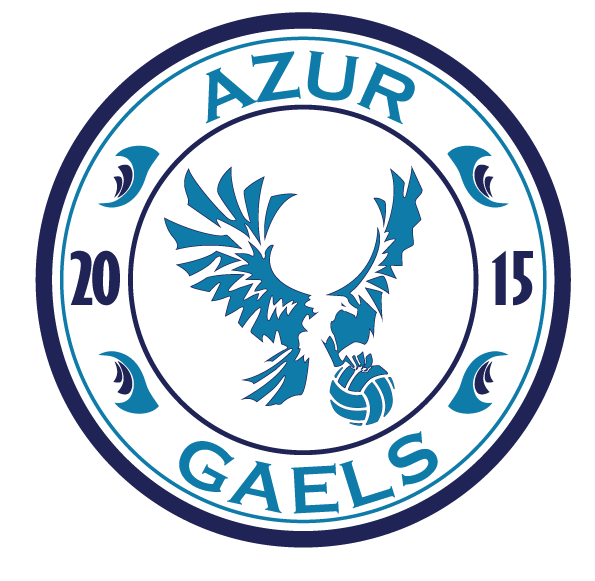 Club Chairman Richard Faul, accompanied on the podium by Secretary Ed Bateman and Maxime Devogele, had the honour of presenting Minister Varadkar and Mayor Lisnard with an Azur Gaels jersey each, before attending the speeches and the lighting of the town hall in green. In his speech, Minister Varadkar spoke of his delight at discovering the existence of a GAA club on the Riviera. For the Azur Gaels members present, the ceremony was followed by drinks and an Irish concert, before the big after-party in Ma Nolan’s Cannes! 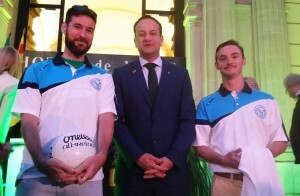 This event, occurring just one week before the first ever French gaelic football championship tournament held on the Riviera, is another indicator of the club’s progress and its growing reputation as a standard-bearer for Irish culture in the region.